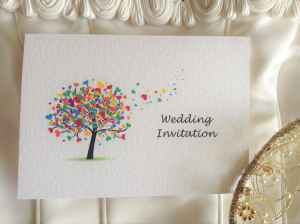 This is just a small selection (more to be added) to give you some ideas – the majority of our wedding invitations on the main page are available with yellow ribbon to match your colour scheme. Opting for a yellow wedding colour scheme for your big day will have your guests smiling from ear to ear. For a fun and zesty wedding create a rustic wedding theme with a summery burst of yellow. We stock yellow ribbon in satin and organza. Order your wedding invitations with yellow ribbon today.